And here come the long-awaited Gas Cowboys. 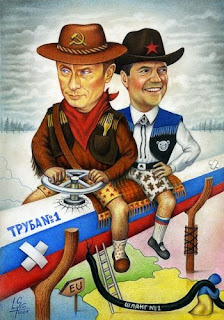 Inspired by the January's "gas crisis", which nearly left half the Europe without heating, this picture represents our happy "Twix" couple as cheerful cowboys mounting the trunk pipeline ("Pipe No.1") which generously supplies the European Union with Russian gas, while some "light-fingered" Ukrainians are trying to "illegally benefit" from the transit -- with the help of their "Hose No.1" which has turned pitch-black from corruption. As you can see, the cowboys were so excited to climb the pipe that they forgot to put their pants on, thereby granting us a rare privilege to observe their underwear, which is especially rewarding in Medvedev's case, who sports a cute pair of teddy bear themed shorts. To avoid any possible misinterpretations, I would like to clarify that the colors of his costume have nothing to do with Estonian flag and the match is purely coincidental.